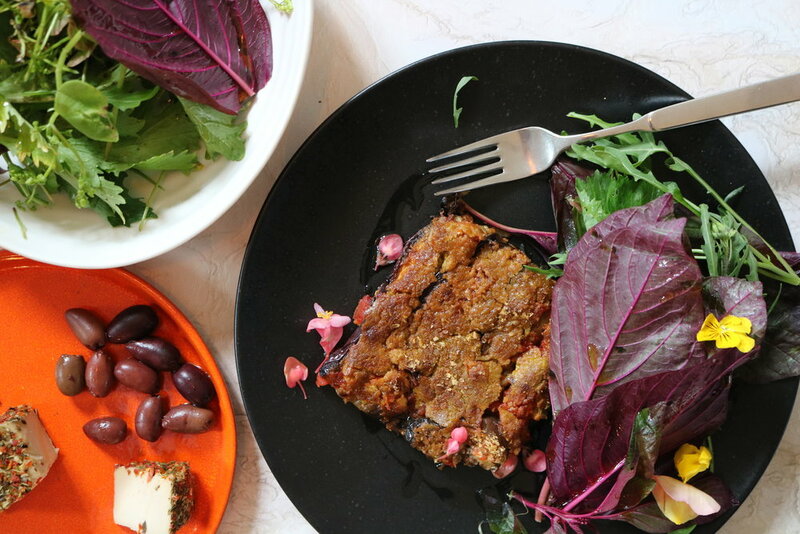 This is a classic aubergine parmigiana gone vegan. The classic tomato and aubergine combination never fails, making this seriously moreish and delicious dish. Serve with crusty bread, some olives, a fresh green salad and glass of wine in the sun and you’ll feel like you’re on holiday! For the tomato sauce, heat a large pan, add your oil and onions and sauté on a medium heat until softened but before they go brown about 5-7 minutes. Add the garlic, cook for another couple of minutes, then add the tomato, red wine vinegar and a pinch of sugar. Turn down the heat and let it simmer for about 15-20 minutes, add your oregano and taste for seasoning. Thinly slice your aubergine, salt and lightly oil one side. Heat a grill pan or large flat frying pan, until hot, grill or fry in single layers until softened and taken on colour. You will probably have to do a few batches, the aubergine should be tender before baking. While you’re grilling make your cashew cheese. Steam the carrots until tender, drain and rinse the cashews. Add all the ingredients to a high speed blender and blend until smooth, taste for seasoning. Cover the base of you baking dish with aubergine slices and cover with half of your tomato sauce, repeat with another layer. Finish with a layer of cashew sauce and sprinkle of nutritional yeast. Roast 200c, for about 20 minutes until the top is browned and golden. Enjoy.